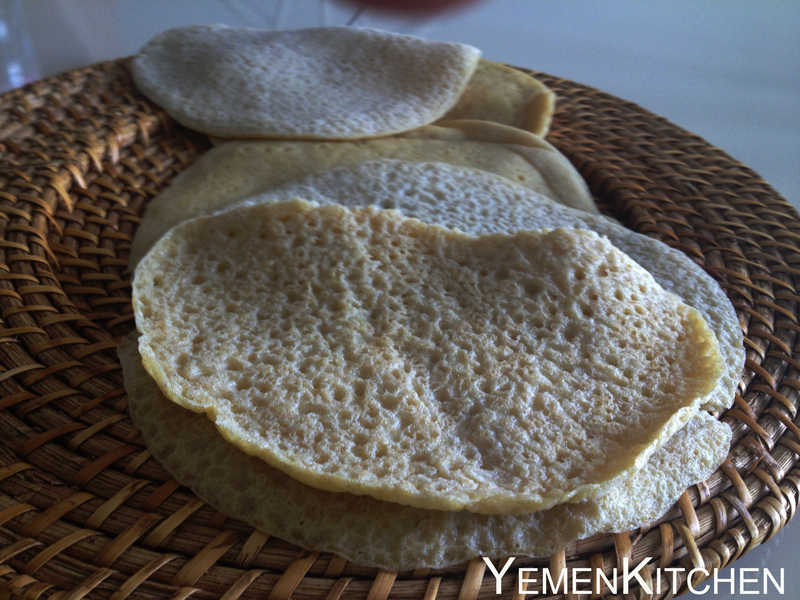 Lahooh is a Yemeni bread that like no other.It mostly looks like pancake but tastes sour. This sourness is due to the fermentation process that the dough goes through and the proportion of liquid to flour. It’s for that reason it’s preferred to be consumed on the same day it’s made or will be very sour, stickier, and breaks down into stiff pieces. You will be surprised how many recipes there are for Lahooh. They usually differentiate in the amount of yeast that is included and the amount of time it took to get fermented. 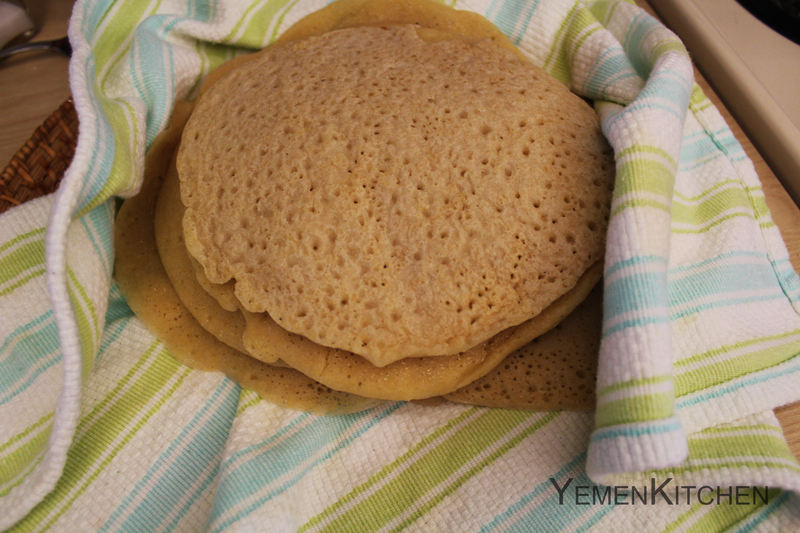 Lahooh in Yemen is the same Enjiera of Ethiopia, only it’s made of Corn and white flour, while the second is made of Tiff flour. This bread, and some other delicious food are part of the African-Yemeni cultural fusion through long history of migrations, wars, and marriages between both civilizations. I grew up eating Lahooh mainly in Shafoot, a Yemeni appetizer that is mainly made of one or two layers of Lahooh bread dipped in yogurt-Khathawir sauce and garnished with salad, grape, or pomegranate, whichever was in season. This was my favorite meal, I could eat a whole 12 inch dish all on my own! Lahooh is also eaten with Zigni, another African influenced super spicy meal that is usually made of chicken with sauce and Ethiopian special spices, hard boiled eggs and served on a bed of Lahooh. The sourness of the bread goes well with the spicy flavor of this exotic meal. Oldest stories of Ethiopian influence in Yemen are traced back to the earliest ages of Christianity in Yemen. Particularly between the 3rd and 5th century A.D.
At that time, Yemen was a competing stadium between bigger kingdoms, the Christian Byzantium and Zoroastrian Persia. Yemen’s positions was Natural at the times as there trade was flourishing and it was important for them to keep good relations with both powers. The main religion at the time was Judaism. Scholars think that Kings of Yemen may favored Judaism for that exact reason and to limit the Ethiopian interference in the country. (1) This however, was difficult to continue, as in 525 AD ,the Negus , or King of Aksum, the Ethiopian Kingdom, that follows the Christian Byzantium church started interfering in South Arabian Affairs, across the red sea controlling western Tehama region and many other areas for the desire to control the trade in Yemen, particularly port of Aden, and had ambitions to start a Byzantine base in the Arabian Peninsula. It’s hard not to mention the Najran Massacre as it was an incident that had a tremendous impact on Yemen at the time, and basically triggered the invasion by Aksums. 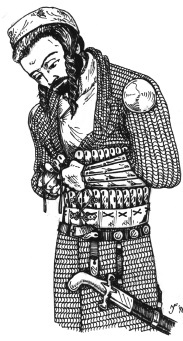 Yusuf Dhu-Nawas, a Yemeni Jewish who ruled Hemyarite kingdom had enough of Aksums interventions in Yemen, he began a war against Christians. In 524 AD he massacred and prosecuted Christians in Najran, in what was to be known as one of the bloodiest massacres known in old history. Najran, which was always part of Yemen, until 1934 became part of Saudi Arabia. It was considered a peaceful haven for Christians, Jewish, and Pagans, and was a financial center for Christian merchants. Tens of thousands Christians were burned alive, the shocking news flew around Arabia and to Europe, raising anger and demanding for revenge. 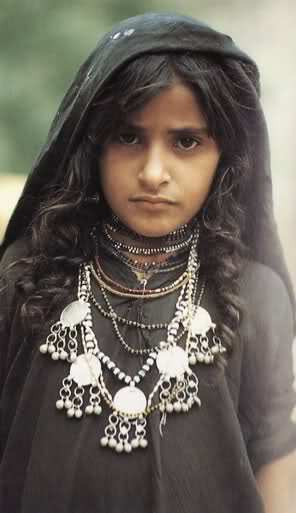 The survived Christian tribes fled to the valley of Jordan and Palestine and lived there ever since. There is a famous story of Abraha the king of Abysians, mentioned in the Holy Quran, who ferried elephants on ships to invade Yemen. He built a church in Sanaa in an attempt to distract the attention from Mecca hoping to change the trade route from Mecca to Sanaa, but it didn’t work for him. Eventually, Aksum’s power deteriorated by time and the church’s ruins got totally demolished in the first century of Islam in Yemen .Myths says that the big mosque in old city of Sanaa was built on its ruins. 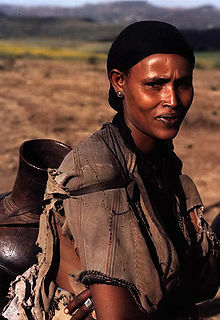 Both countries shared the Amharic language during the Himyarite Kingdom (110 BC–520s) which is now considered the second major used Semitic language after Arabic (2), and the official language of Ethiopia. 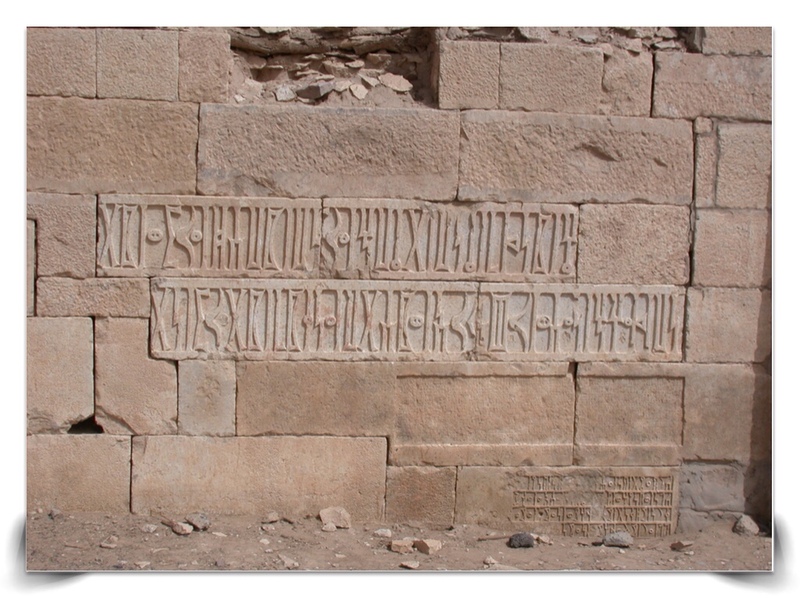 Amharic Language was the official language of Himyar Kingdom, and was written on stones of dams and shrines with Almusnad script. I grew up seeing my mom talking to Ethiopian domestic helper in Amharic. She gained some language skills in talking with Ethiopians from my grandma who speaks it fluently after she lived couple of years in Asmara as a wife of a diplomat. To my surprise I was able at the time to complete brief talks and simple sentences in Amharic just by listening to what my mom and the lady would talk. I also noticed that Ethiopians learn Arabic within months, because of the common roots between both languages. The influence of both countries had always been strong on each other, and the modern relations between both aren’t any less complex than its history, however, Lahooh and Enjiera are two sides of the same coin, and will still be enjoyed by both of Yemen’s and Ethiopia’s people. First mix white flour with Corn flour, put them in the oven to get toasted and turn light golden, get it out later and wait until completely cold. 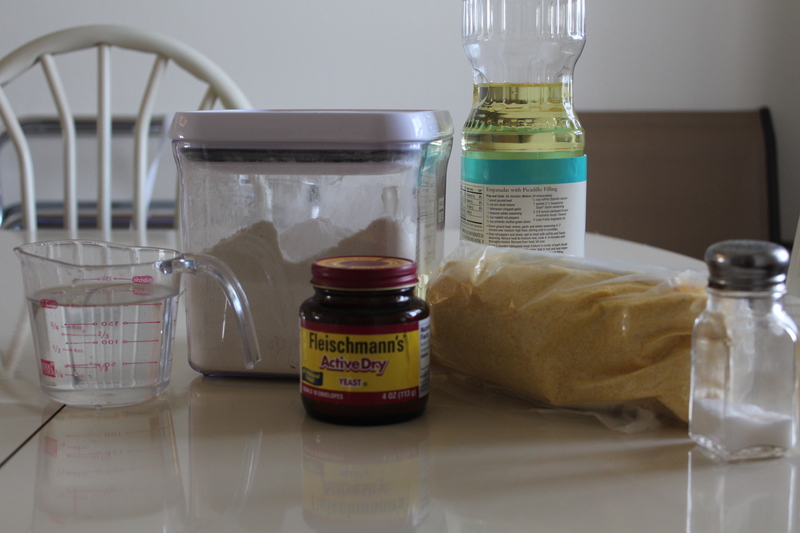 Mix with Yeast, salt and gradually add water until it turns soluble and very light in texture. Cover the mix tightly with a plastic bag and put in a warm place for around 1.5 hours, or until the mixture turns with big bubbles, and smells a little sour. -Start warming the pan (preferably used only for Lahooh) and wipe its surface with little oil, wait until it gains heat. Start adding some of the mixture and quickly move it around the pan before it dries up. -wait until it completely dry up and turn it upside down for a little. -Make sure that the Lahooh you make are covered in a dry thick towel to keep them warm and the elastic texture of the Lahooh is maintained even after it gets cold.